Although women do not play a prominent role in most Book of Mormon stories, their importance and influence is apparent. Nephi, for instance, foresaw that the Savior Himself would be born of a virgin (1 Nephi 11:13–20). Abish was instrumental in bringing her people to the knowledge of Christ. And the two thousand stripling warriors helped save the Nephite nation because of the faith and influence of their righteous mothers (Alma 56:47–48). Women have also played important roles in the LDS Church in our own gospel dispensation. To acknowledge and appreciate this influence, the Church Historian’s Press recently selected and published a collection of discourses given by LDS women from 1831 to 2016. Not only do these talks show the vital contribution women have made to the Church and its people, but they also highlight how LDS women have promoted, defended, and utilized the Book of Mormon. Are we familiar with the ancient record of the inhabitants of this continent, the Book of Mormon? And are we familiar with the great truths that are taught therein and with those books that teach us the beauties of the work in which we are engaged today? I am afraid we are not sufficiently conversant with the principles of the gospel and that we are not as diligent as we should be. In 1975 Belle S. Spafford was the General Relief Society President. She had also been “affiliated with the NCW [National Council of Women] for fifty-two years” and had even served as its president. Drawing on these experiences, she used the Book of Mormon to help explain why women should look to God and His prophetic messengers for spiritual guidance about women’s divine role and worth. Counseling on the desirability of representative government, King Mosiah made this significant statement: “It is common for the lesser part of the people to desire that which is not right” [Mosiah 29:26]. Now, having this warning from a great Book of Mormon prophet, Latter-day Saints would do well to be particularly careful to weigh the voices of the people in the light of the teachings of our modern-day prophets. Even though the voices may be few, they are usually loud and convincing. Possessing revealed truth and the words of the prophets as they relate to the responsibility of the Latter-day Saint woman and her role in life, we have an unwavering duty to uphold these teachings in our speech and actions, and to direct our lives in harmony with them. It was so clear. It was almost like I was there. I knew exactly what every word meant in English. So it was easy to translate into Xhosa, which does not happen to me now. I understood [the Book of Mormon] with a clarity that I cannot explain, even the portions from Isaiah. I kept saying to myself, “I feel like there is a lightbulb that lit up in my brain. I am not usually this smart,” and I know now that it was a gift from God. I did not do it alone; I had help. These are only three samples from many selected teachings and testimonies highlighted by the Church Historian’s Press. But they beautifully illustrate how the women of the Church have done so much to promote and share the Book of Mormon with the world. They also show how, beginning with Emma Smith, God has called upon women in our dispensation “to expound scriptures, and to exhort the church, according as it shall be given thee by my Spirit” (Doctrine and Covenants 25:7). Even though God called male prophets to write the Book of Mormon, its message is meant for all people. As the prophet Nephi taught, God invites all people “to come unto him and partake of his goodness; and he denieth none that come unto him, black and white, bond and free, male and female; and he remembereth the heathen; and all are alike unto God, both Jew and Gentile” (2 Nephi 26:33). “Behold, my joy is full, yea, my heart is brim with joy, and I will rejoice in my God” [Alma 26:11]. Maurine Jensen Proctor, “Serious Reflection Precedes Revelation,” BYU Women’s Conference, May 2006, online at churchhistorianspress.org. Irina Kratzer, “Decisions and Miracles: And Now I See,” Brigham Young University Women’s Conference, April 2000, online at churchhistorianspress.org. Lucy Mack Smith, “Where Is Your Confidence in God?” Gathering of Emigrating Saints at Lake Erie, Buffalo, New York, May 1831, online at churchhistorianspress.org. See Book of Mormon Central, “Why Are So Few Women Mentioned in the Book of Mormon? (2 Nephi 26:33),” KnoWhy (December 19, 2017). See Book of Mormon Central, “What Does the Virgin Mary Have to Do with the Tree of Life? (1 Nephi 11:18),” KnoWhy 13 (January 18, 2016). See “At the Pulpit: 185 Years of Discourses by Latter-day Saint Women,” online at churchhistorianspress.org. Rachel H. Leatham, “God Has Revealed It unto Me,” Annual General Conference Outdoor Overflow Meeting, April 1908, online at churchhistorianspress.org. Leatham, “God Has Revealed It unto Me,” online at churchhistorianspress.org. Belle S. Spafford, “Latter-day Saint Women in Today’s Changing World,” Brigham Young University Devotional, February 1975, online at churchhistorianspress.org. 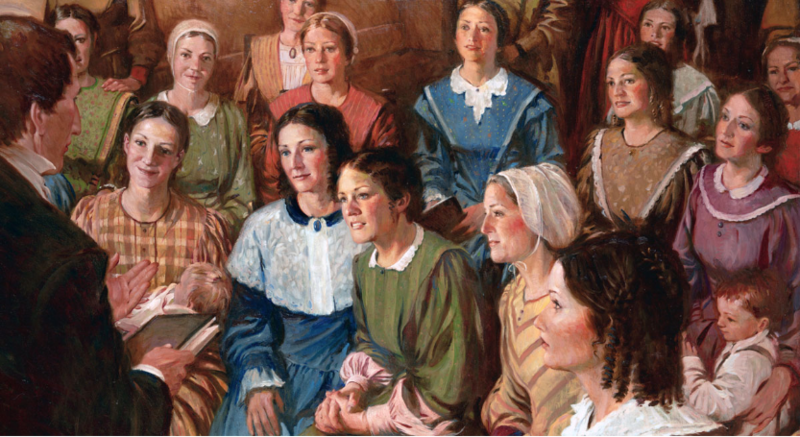 Spafford, “Latter-day Saint Women,” online at churchhistorianspress.org. Judy Brummer, “Our Father in Heaven Has a Mission for Us,” from a devotional given at Salt Lake City, Utah, April 2012, online at churchhistorianspress.org. Brummer, “Our Father in Heaven,” online at churchhistorianspress.org. Book of Mormon Central, “Why Are So Few Women Mentioned in the Book of Mormon? (2 Nephi 26:33),” KnoWhy (December 19, 2017). Carole M. Stephens, “We Have Great Reason to Rejoice,” Ensign, November 2013, online at lds.org.